Good news! 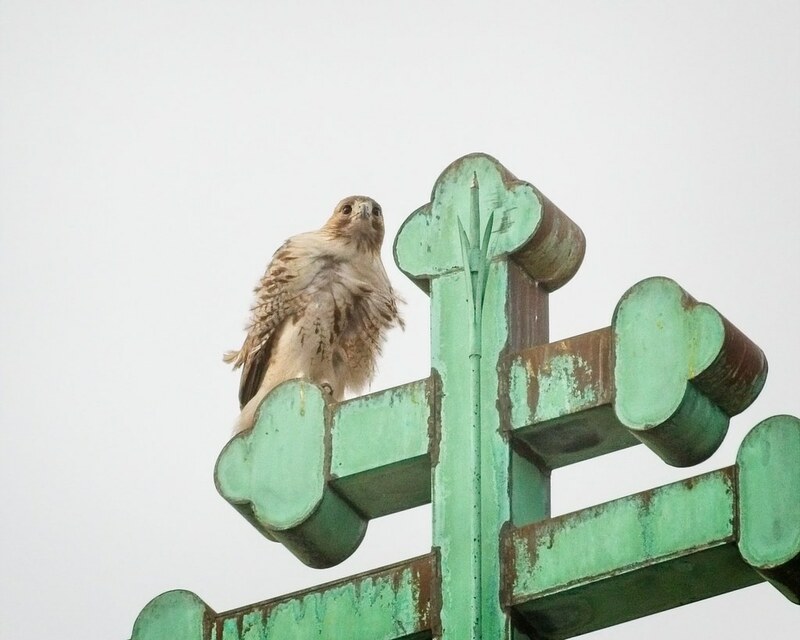 The Tompkins Square hawks have had at least one hatch over the weekend. I believe a hatch started or occurred on Saturday, April 20. 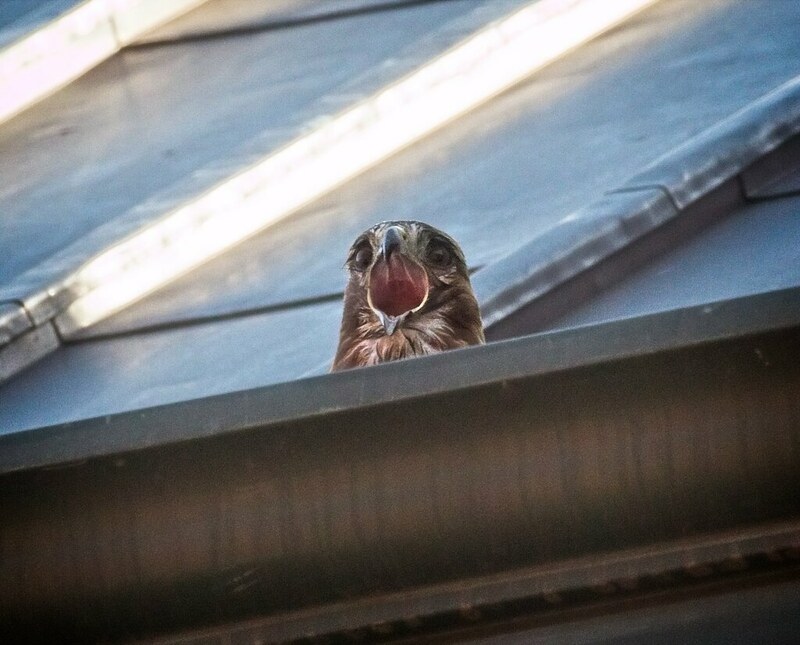 The behavior of parents, Christo and Amelia changed that day - she kept fussing around in the nest and sitting up higher, indicating something was going on underneath her. 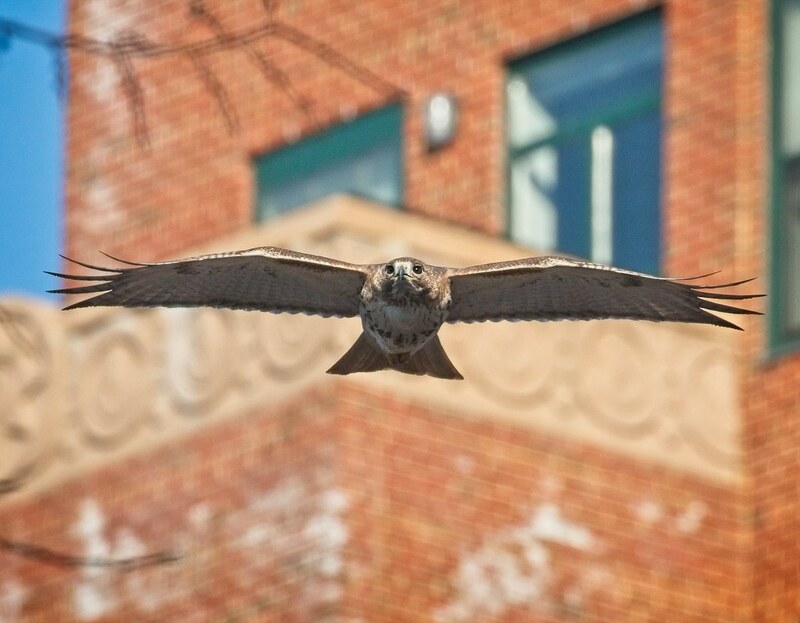 Christo also made two food deliveries to the nest. 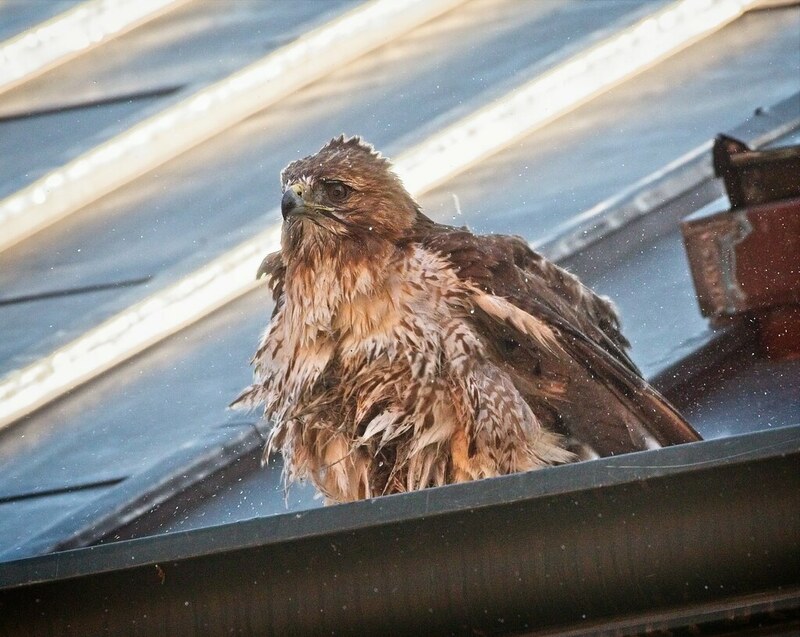 There had been a heavy rainfall the night before, and Christo brought in several pieces of bark, possibly to create a new dry layer in the nest. 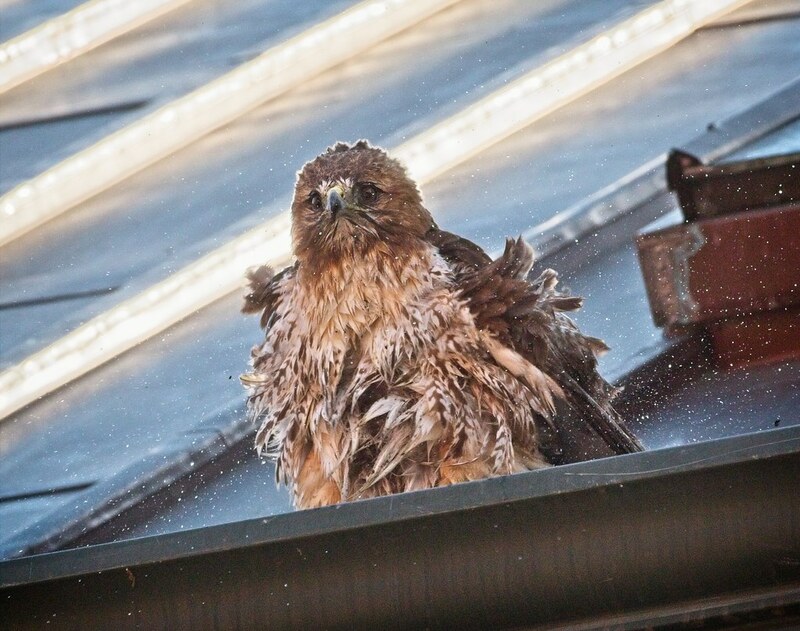 This evening, I watched Christo again deliver food to the nest, but it was raining, so Amelia was reluctant to get up. 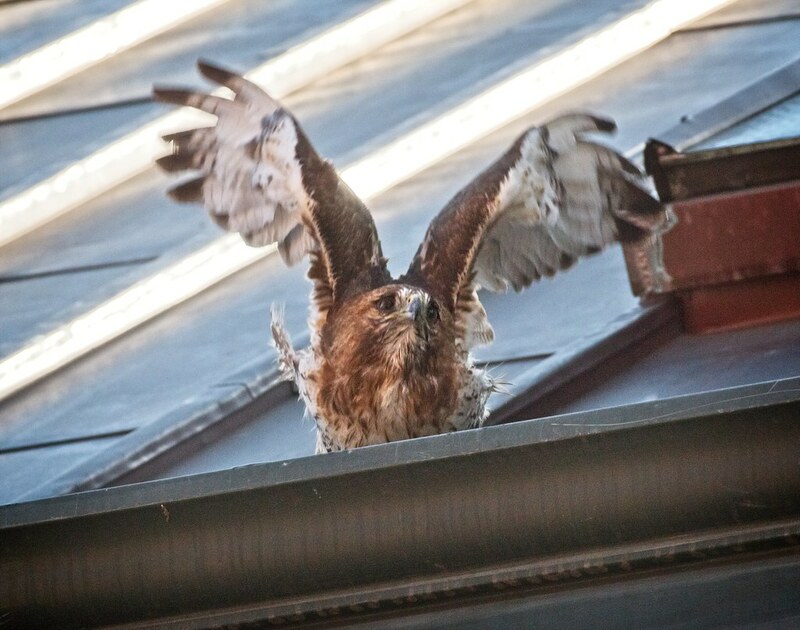 Meanwhile, the Washington Square Park hawks have had a hatch and you can watch the nest activity on the live NYU hawk cam. 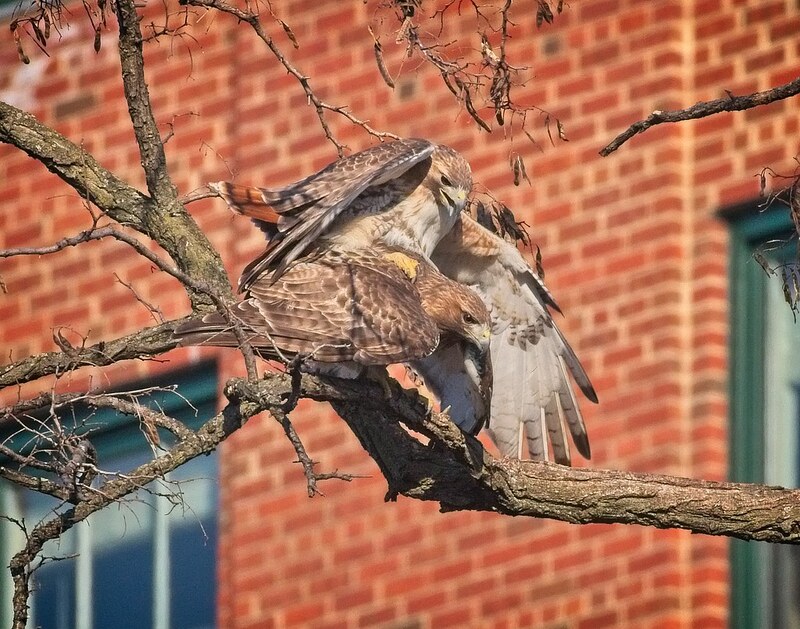 For more details and updates on the Washington Square hawk family, check out Roger Paw's blog. 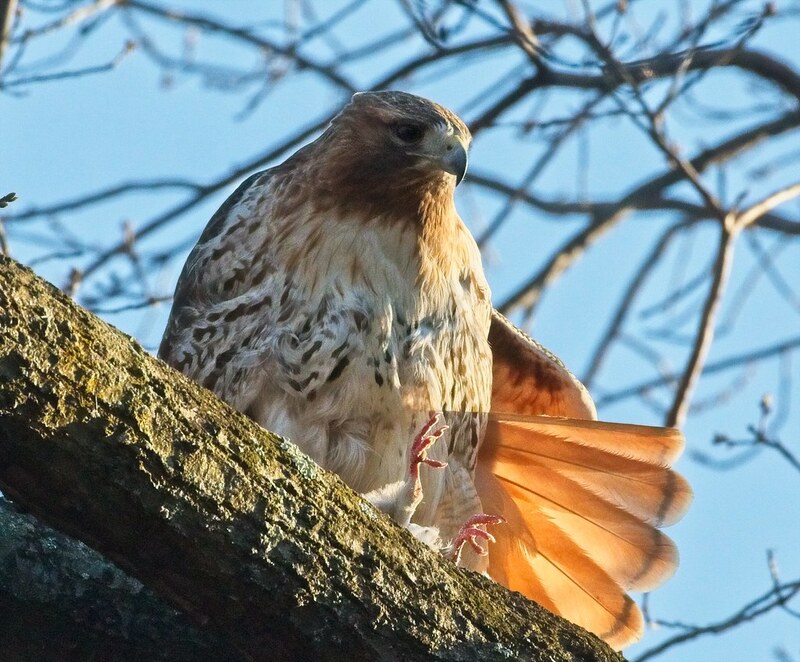 We're on hatch-watch for red-tails, Christo and Amelia, in Tompkins Square Park. Assuming Amelia laid her first egg on March 13, we can estimate hatch time will be in the next few days. 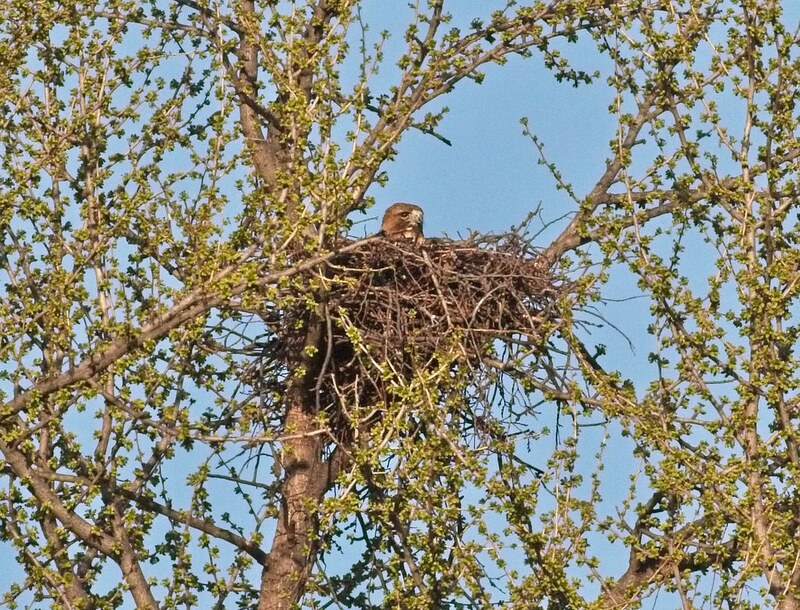 This evening, I found Christo on the nest when I arrived at the park. 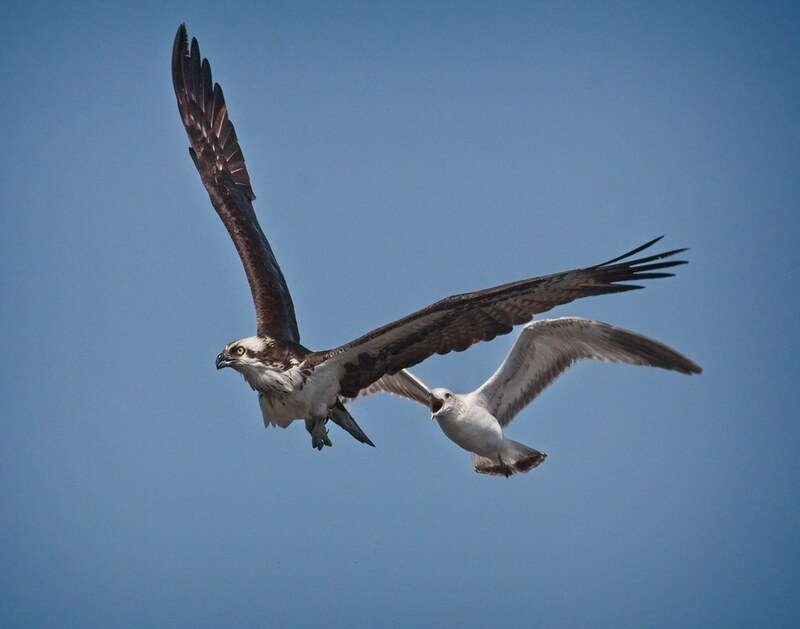 As Amelia swooped in, Christo was barely visible peeking over the edge of the nest. Amelia had to maneuver her huge wings through all the tiny branches of the ginkgo tree. Note the leaves are beginning to unfurl. 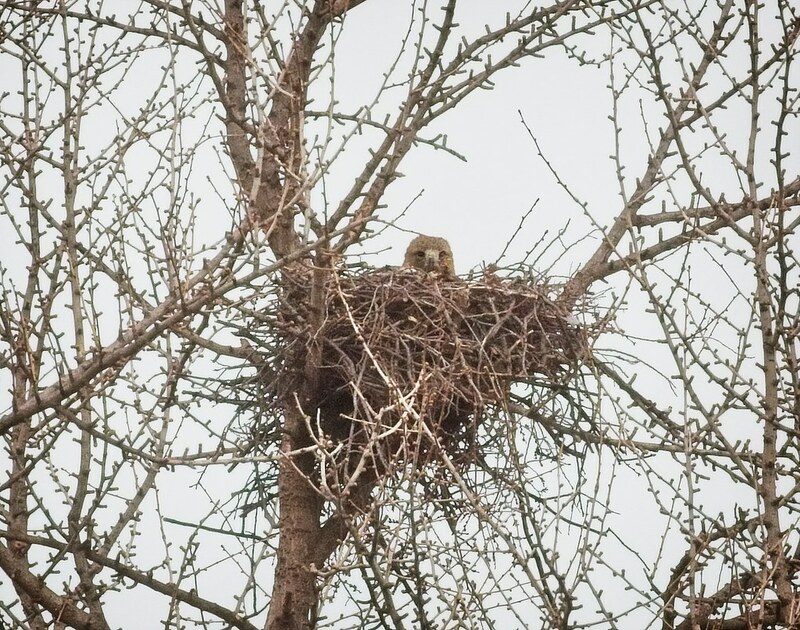 Soon, it will be much more difficult to get a clear view of the nest. 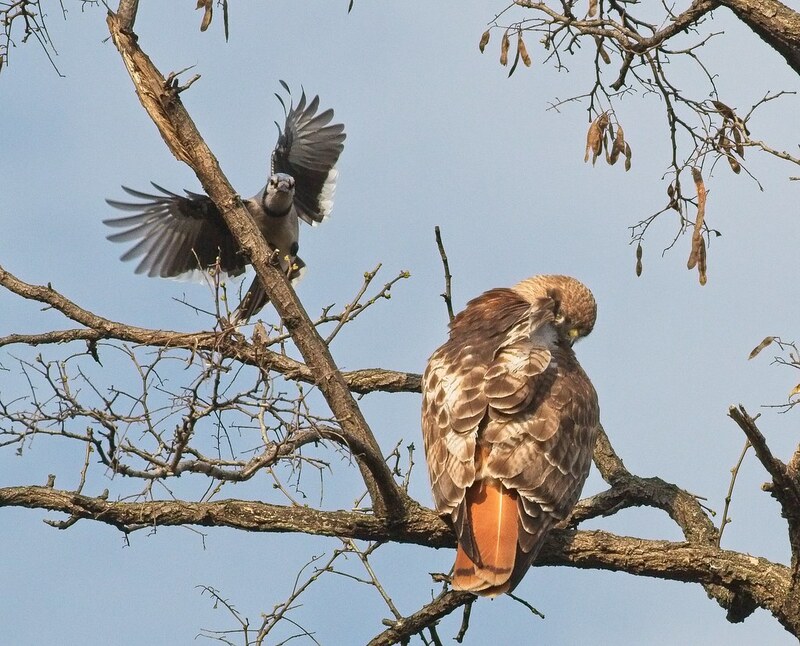 A short while later, a blue jay harassed Christo, taking advantage of him as he preened. 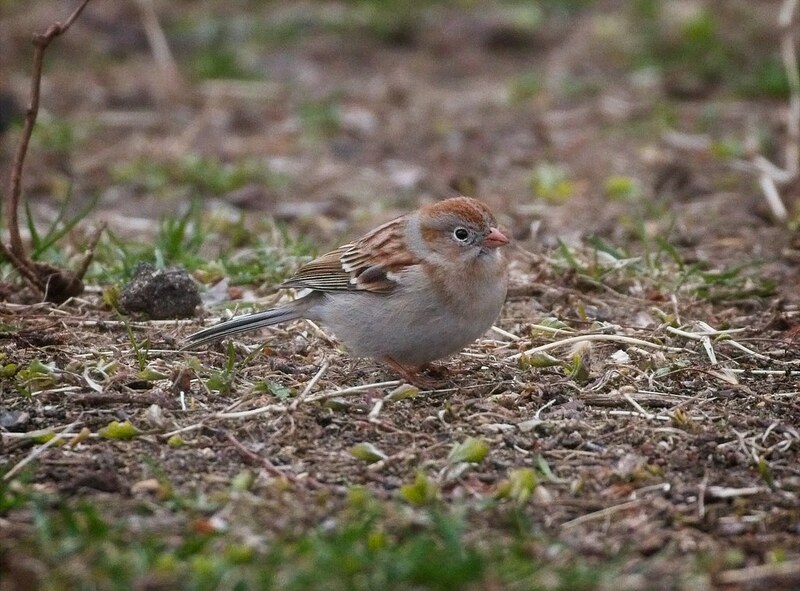 Meanwhile, more spring migrants are appearing in the park, like this pretty little Swamp Sparrow. 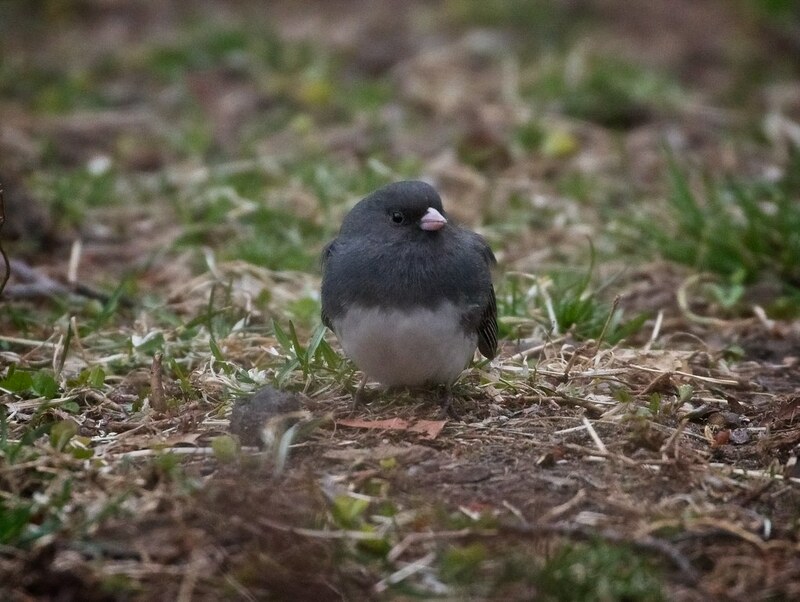 You can see all the recent bird sightings in Tompkins Square on eBird. 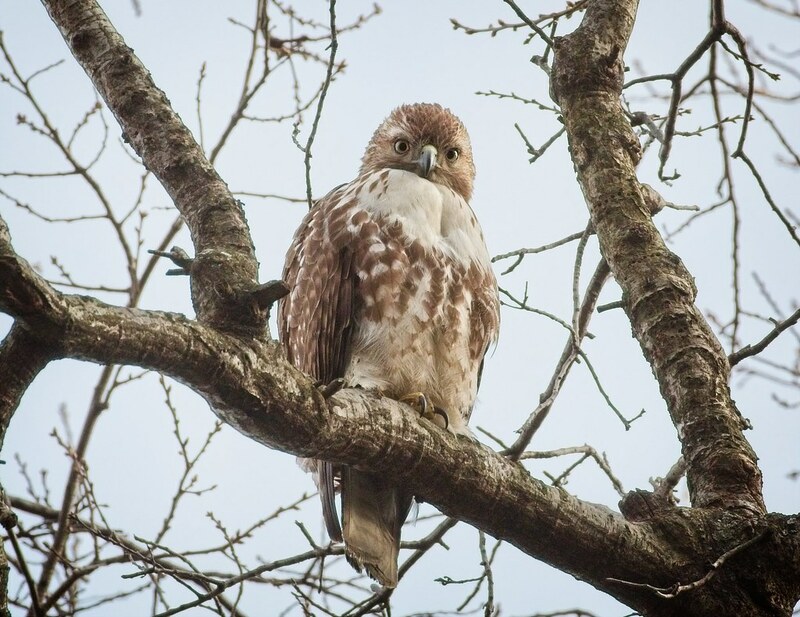 The next few weeks should see an increase in bird species as they migrate north for the breeding season. 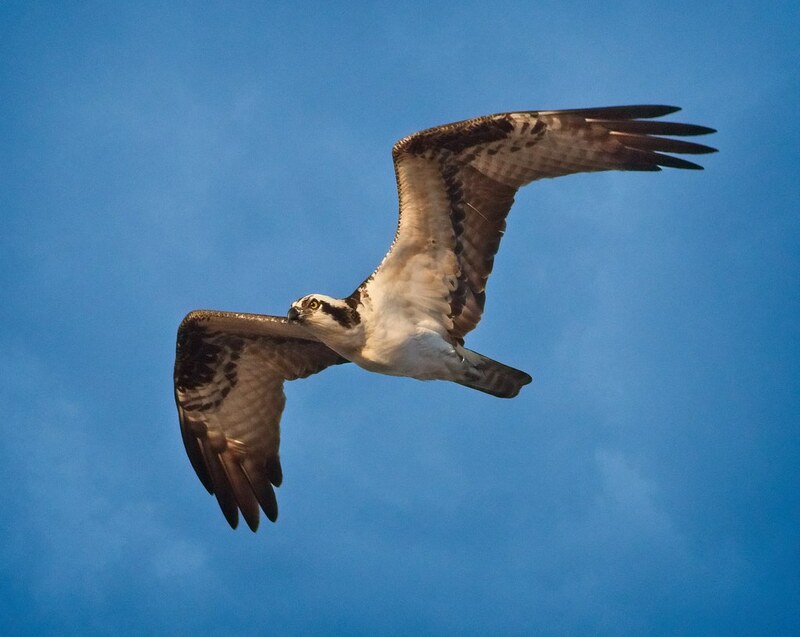 It's that time of year when Ospreys make their way back north to their nesting grounds, but not everyone is welcoming them home. 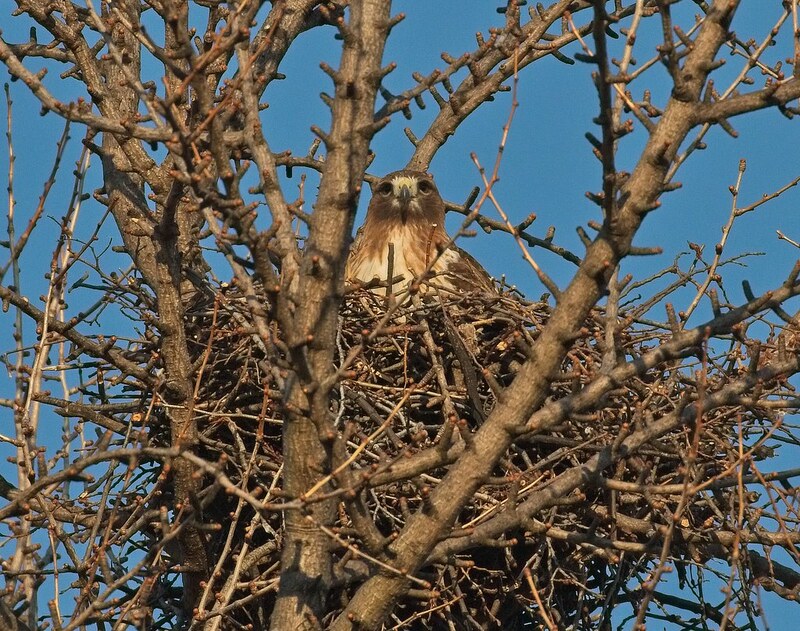 A great place to safely observe ospreys without being intrusive is Jamaica Bay Wildlife Refuge in Queens. 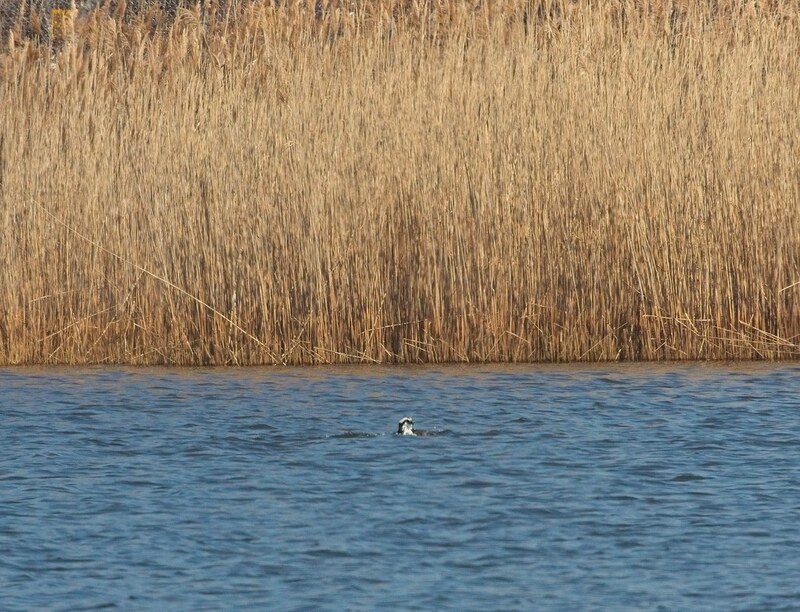 Over the weekend, I spotted four pairs as they worked on their nests and went fishing. 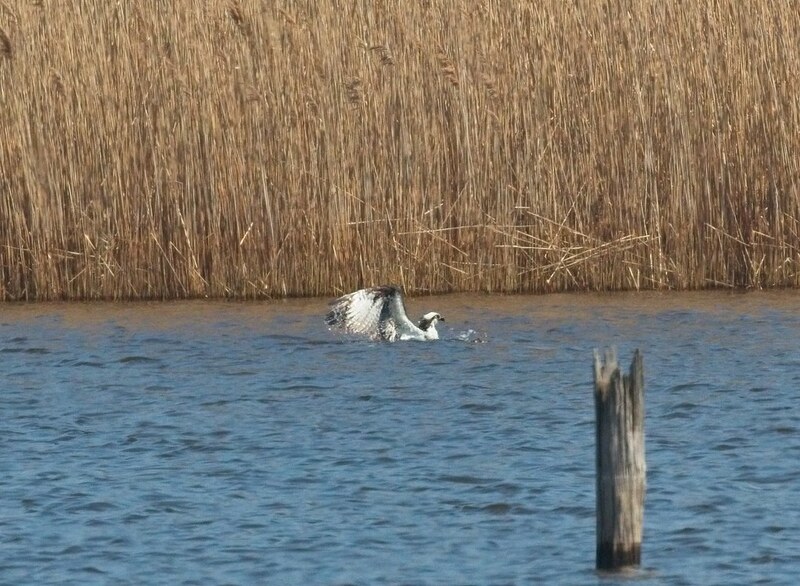 I watched one individual who kept flying back and forth over the water, then diving in at specific points. It would fly one way, dive in and get completely submerged, then flap its way out of the water and fly back the other way, diving in again about a hundred feet from where it started. It repeated this about ten times before gulls chased it out of the area. 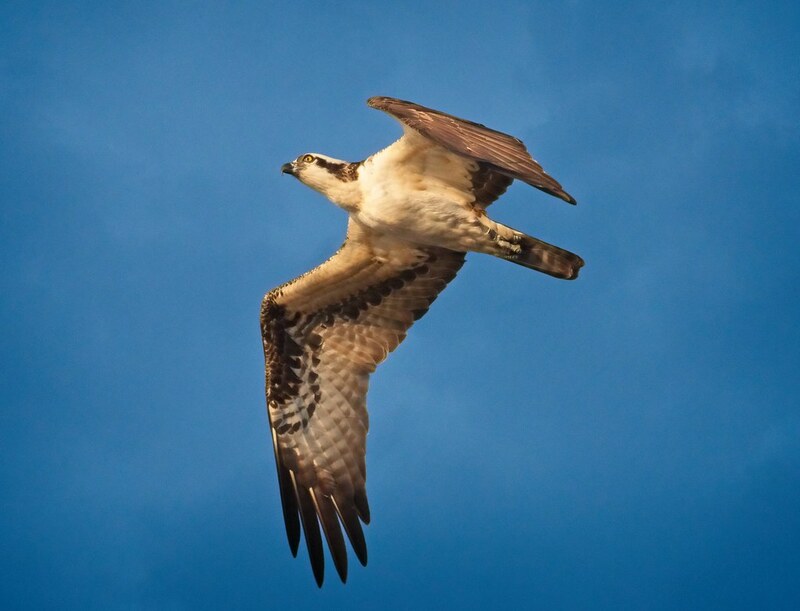 Later in the day, the ospreys flew close overhead and I could see them much better. 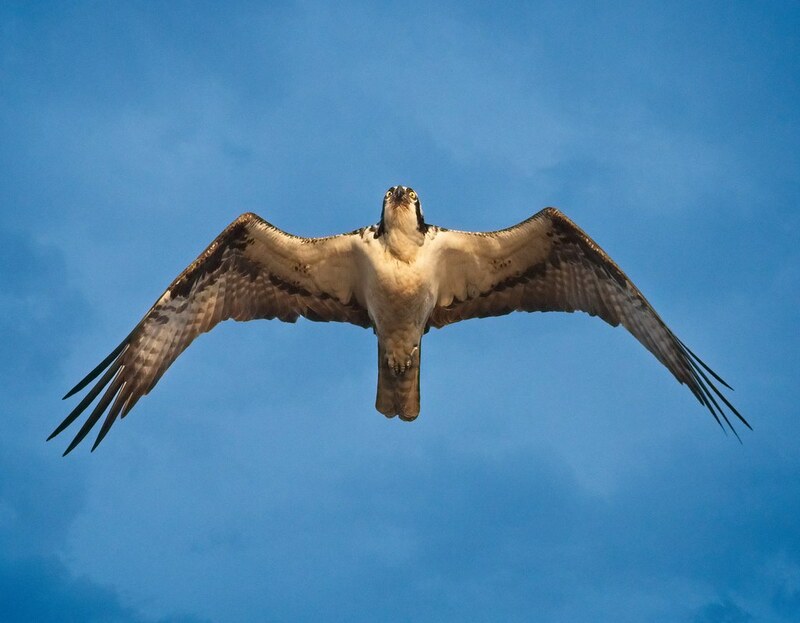 Their lanky black and white wings are so beautiful when they glide through the air. 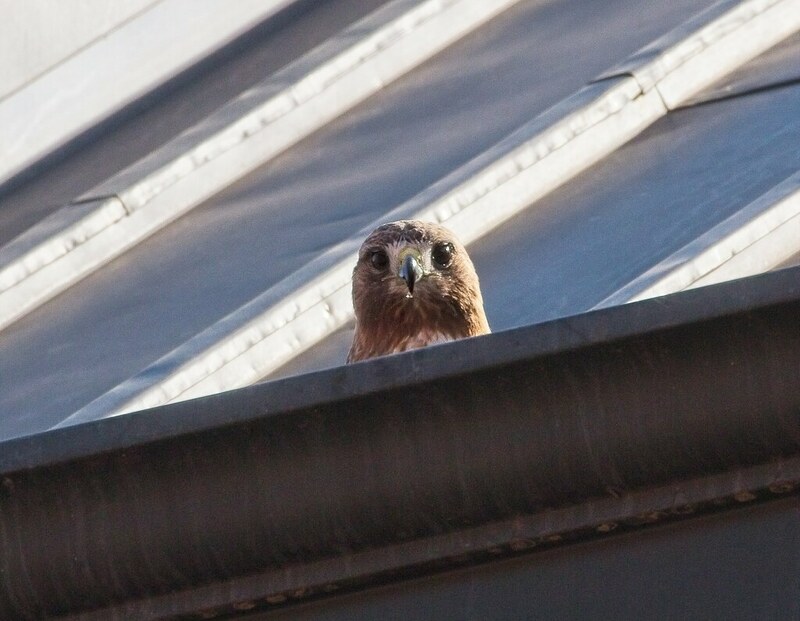 This is a pair - one individual in the two shots above, and a second individual below. 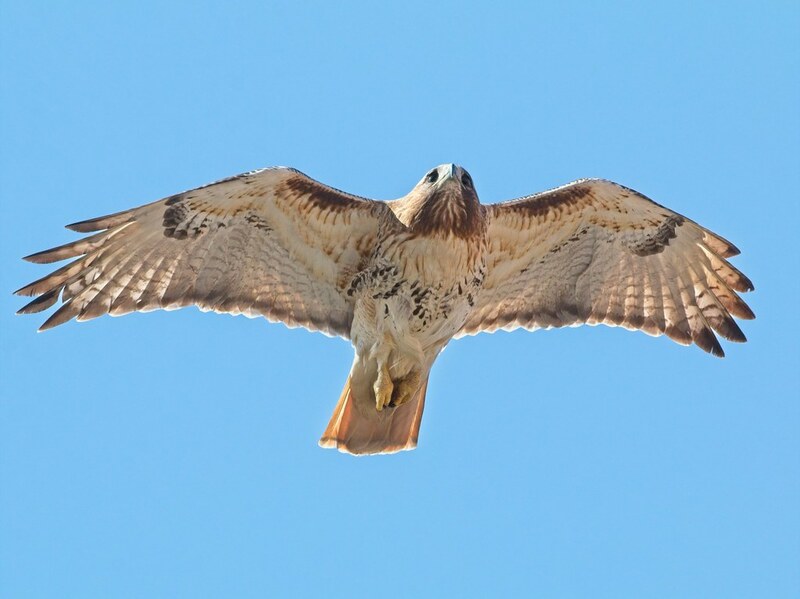 There are a few nest platforms at the refuge that can be seen well with binoculars or a scope. 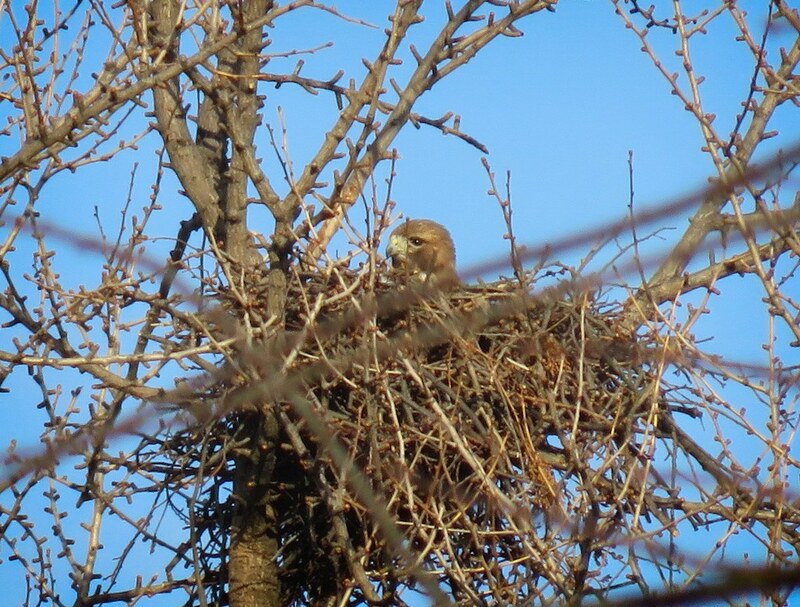 Look closely at the nest pictured below - I believe that's a shirt hanging off the right side. 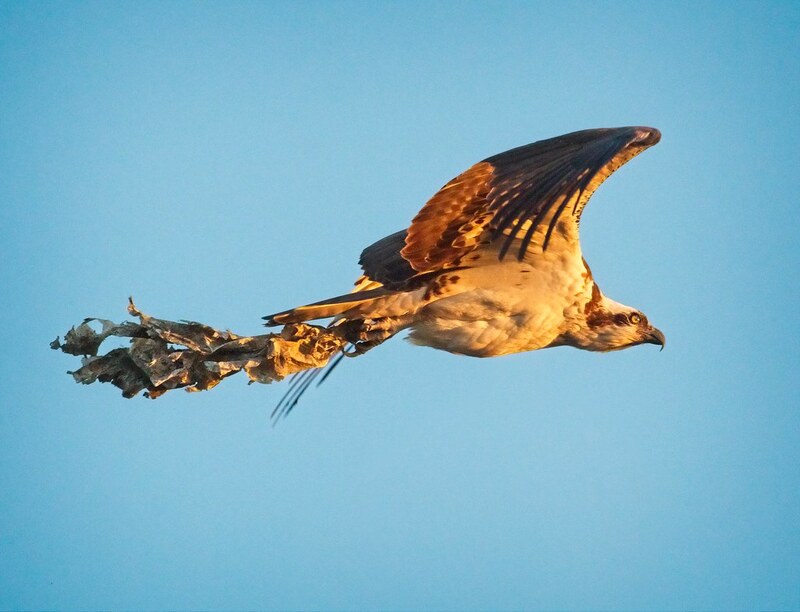 And as I watched, the osprey cleared some junk out of the top of the nest and flew away with it. A little spring cleaning to spruce up the nest in preparation for eggs. 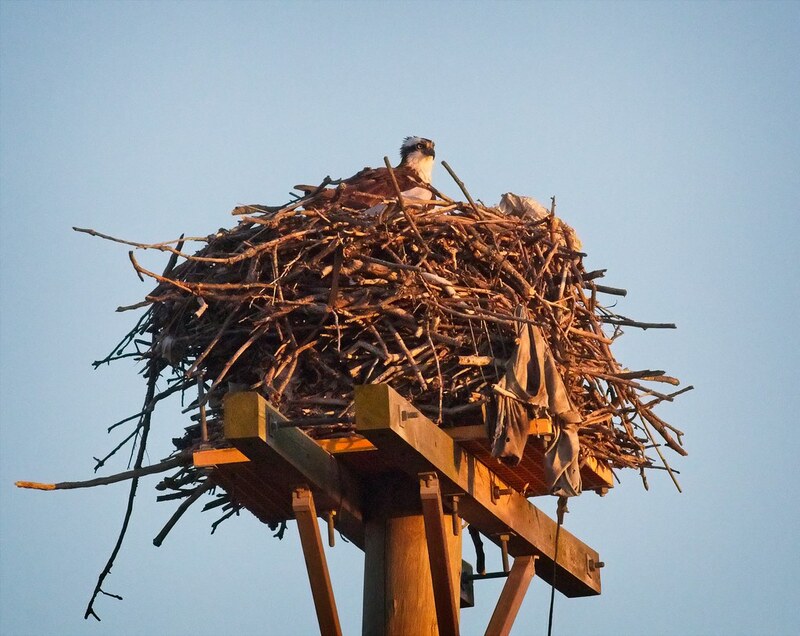 Be sure to check out my favorite live Osprey Cam, which documents a pair, Iris and Louis, just outside of Hellgate Canyon, near Missoula, Montana. 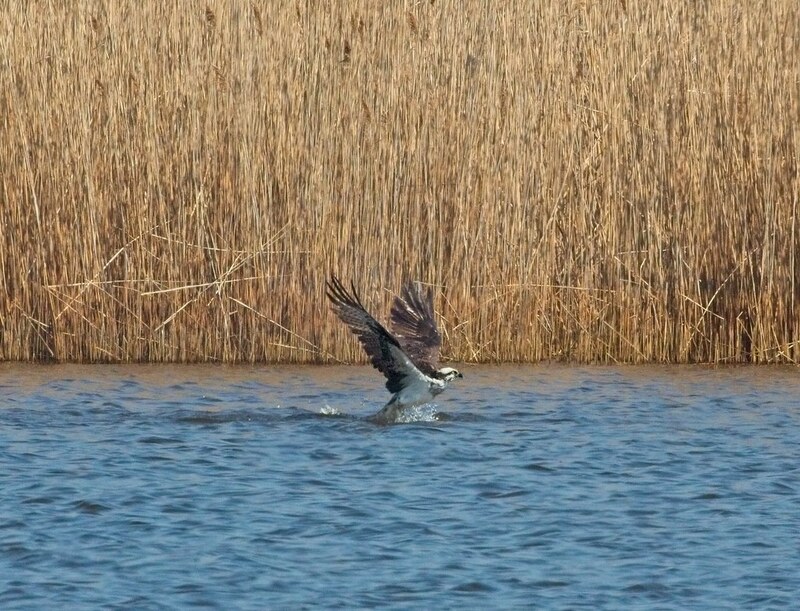 Iris is estimated to be about 24 years old, making her one of the oldest ospreys in the world. She's an incredible creature and they're both fascinating to watch. 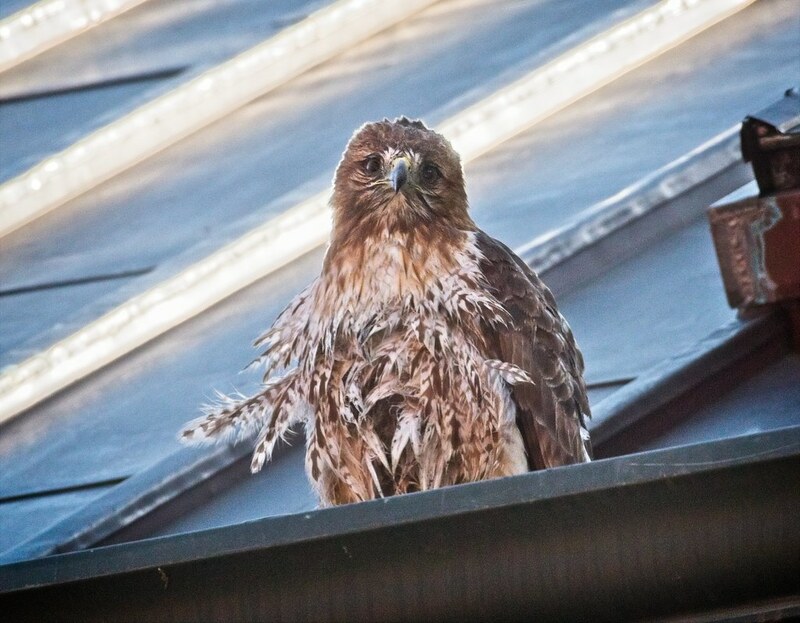 Red-tails, Christo and Amelia, are still brooding eggs in Tompkins Square and everything seems to be going as it should. I'm estimating hatching should happen in the next couple of weeks. 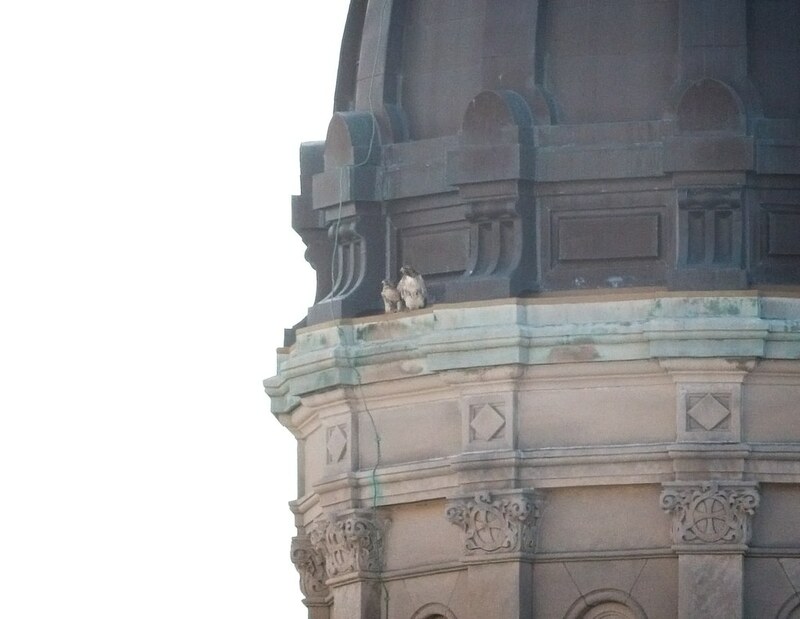 In the mean time, there's not much hawk activity to see except when they trade off shifts on the nest. 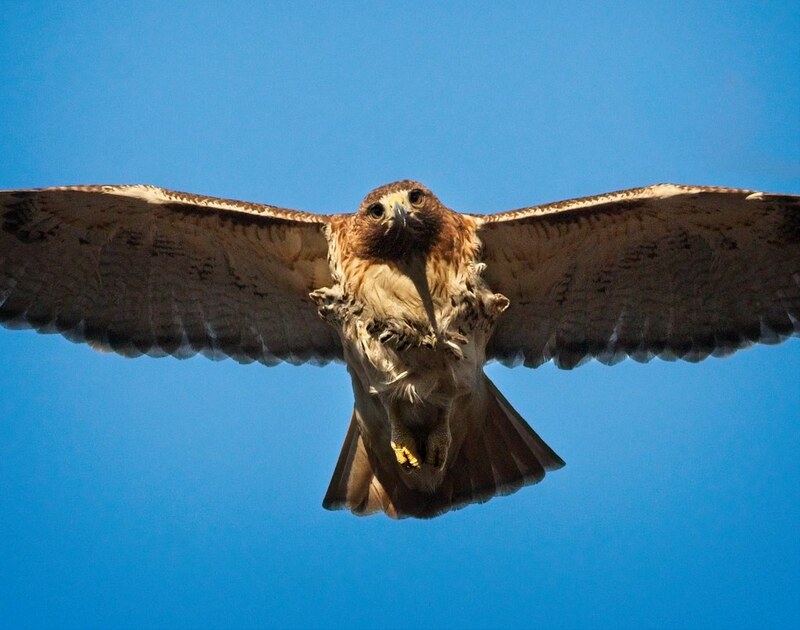 Below, Amelia soars over me on her way to stretch her wings and get some dinner. 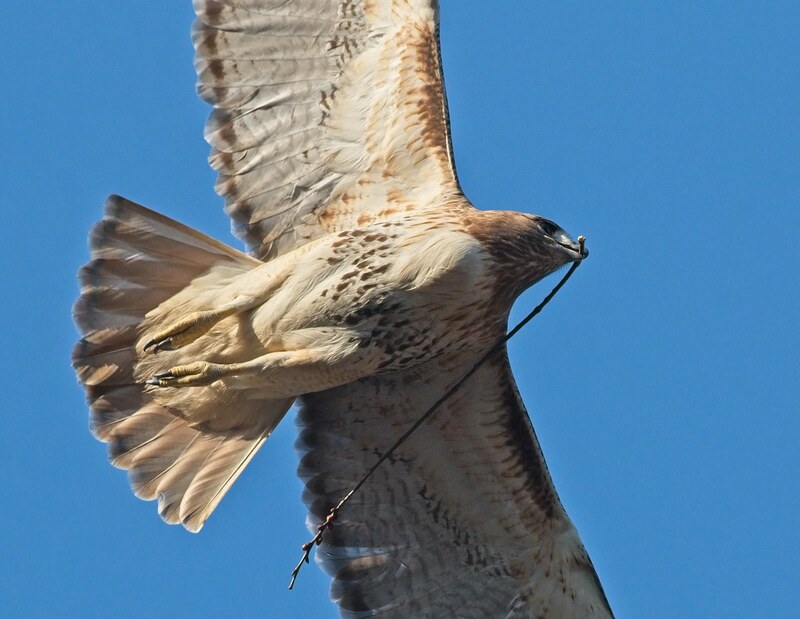 Dinner was previously prepared and delivered by Christo, who caught a white pigeon. 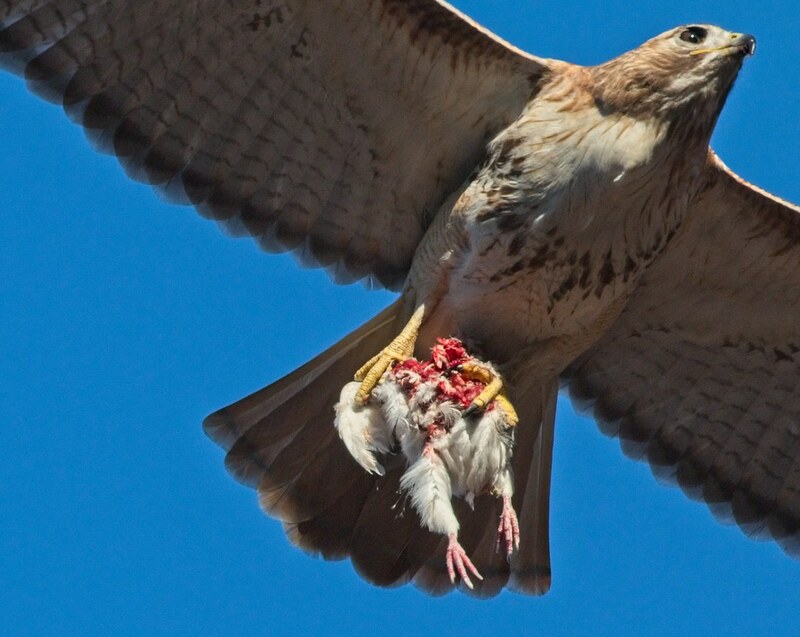 Before delivering the pigeon, Christo took the front half for himself, saving Amelia the meaty bits. 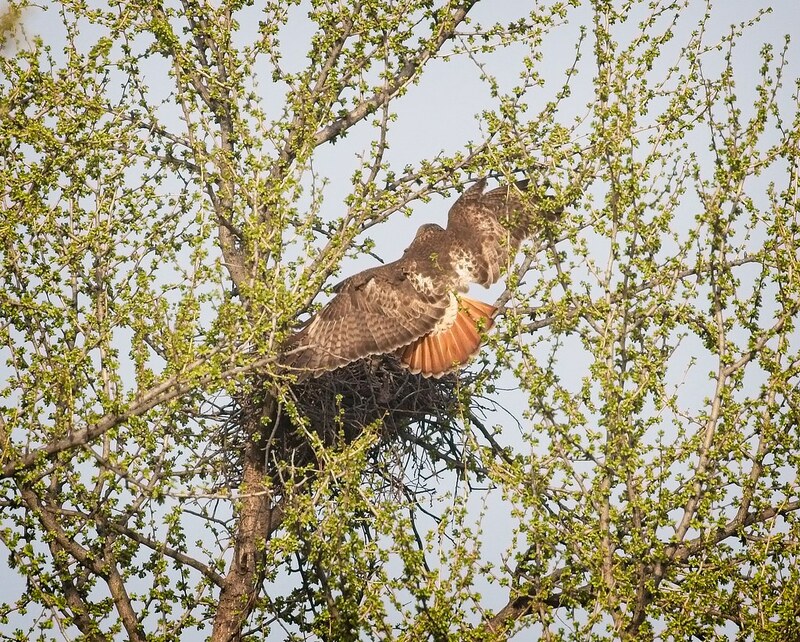 He left dinner on a branch for Amelia to pick up while he took over brooding the eggs. Below, Amelia pauses before tucking into her meal. 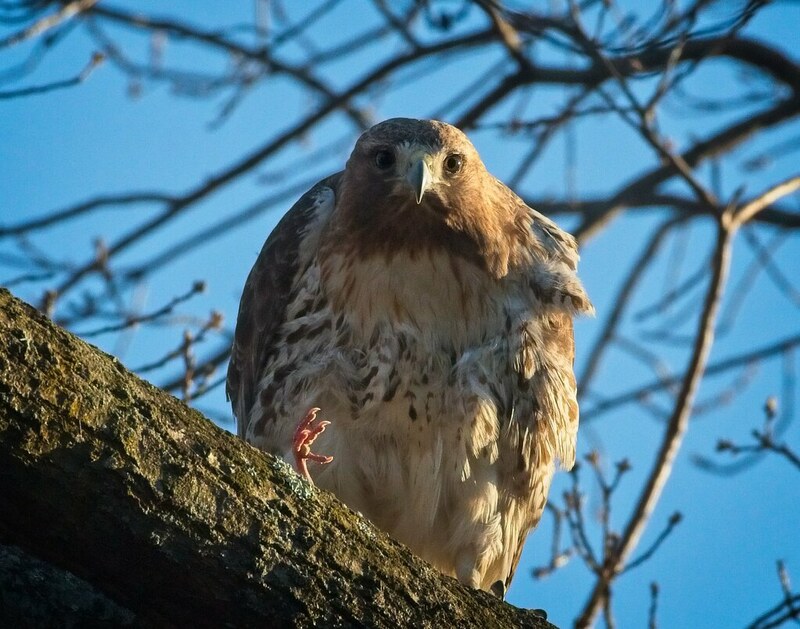 Outside the park, there are still some young red-tails around, such as this one seen in Stuyvesant Town. Judging by its bulging crop, it recently ate a big meal. 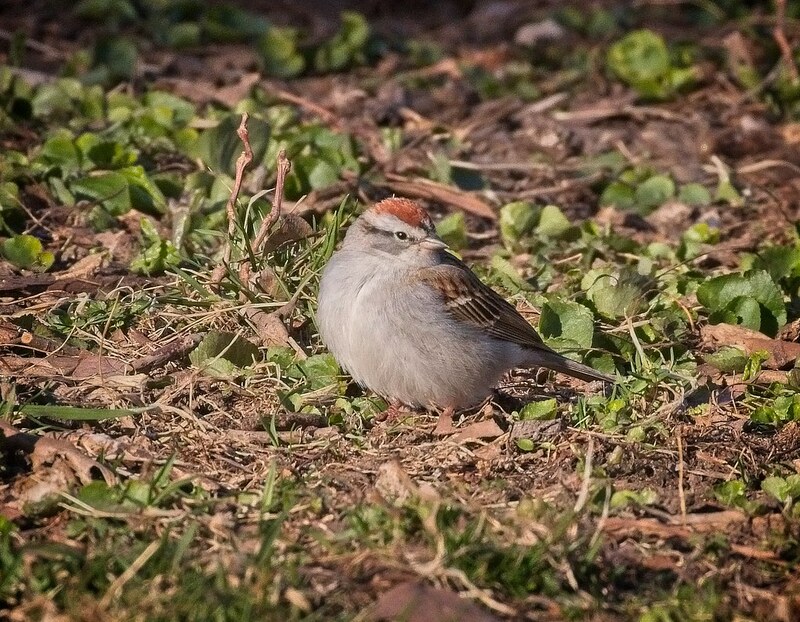 And with spring bird migration under way, there are more small birds passing through the area, like this cute little Chipping Sparrow that was foraging on the lawn in Tompkins Square. 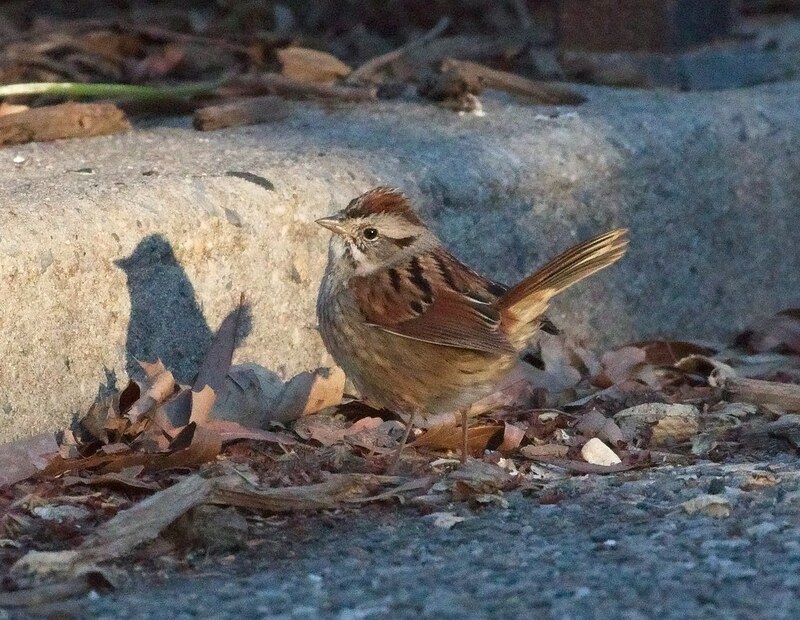 To plan for the best time to see spring migrants, check out Birdcast, which uses radar and weather information to predict bird movements across the continent. 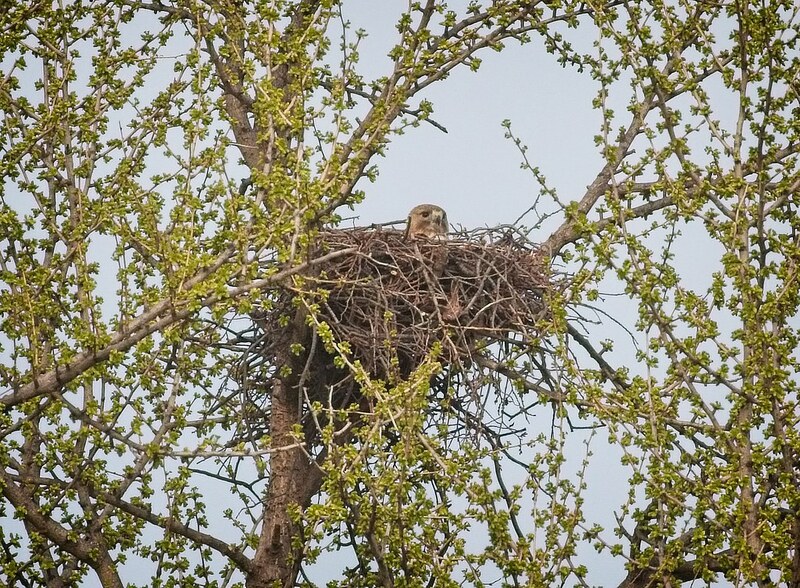 The nest this year sits slightly higher than the one last year, so it will be interesting to see if there is a view of it at all once the leaves grow in on the tree. I took the photos below two days before Amelia settled in to begin brooding. Amelia is on the left and Christo is on the right. 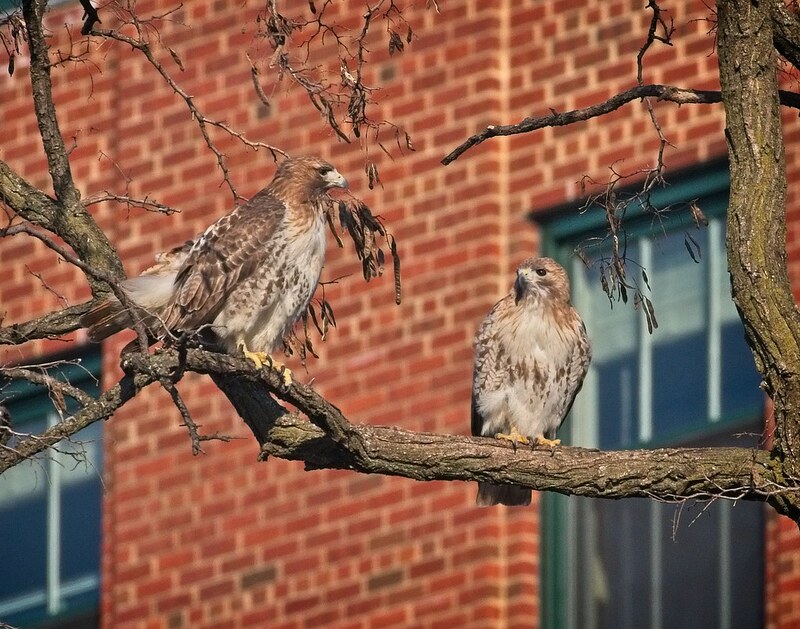 Note their size difference (she's larger) and coloring (he has a lighter head with a mostly white throat). When you see them in this position, it's easy to tell who is who! Afterwards, Christo soars past his namesake, the Christodora building. 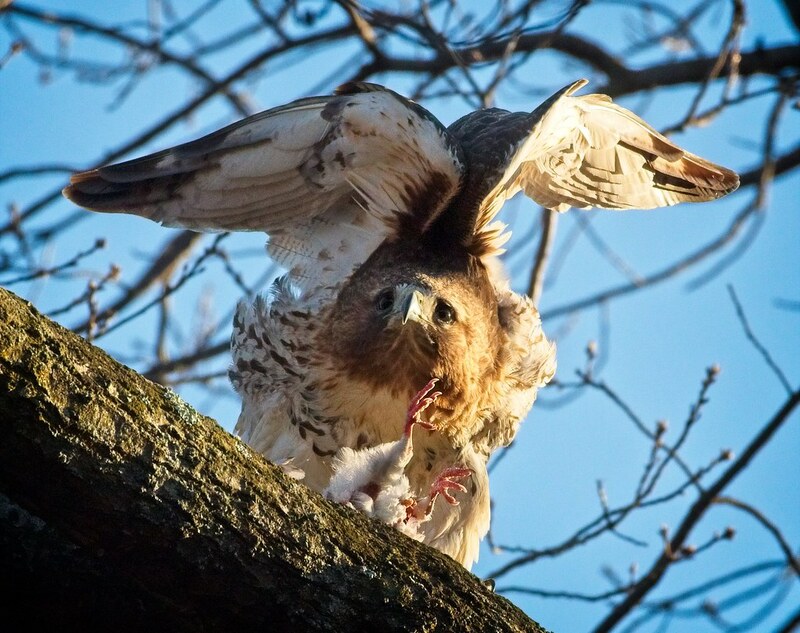 While Amelia spends most of her time on the nest, Christo brings her food, like this fresh rat. 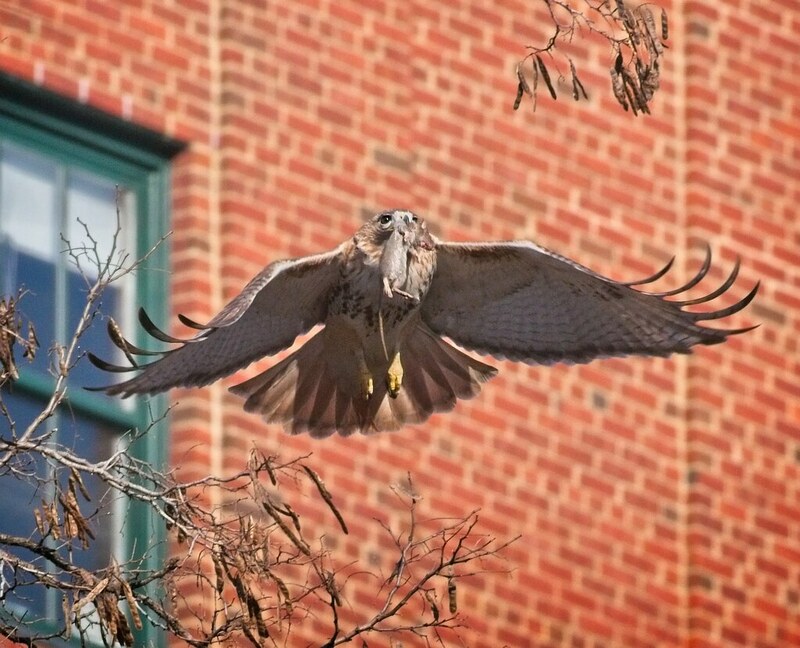 Amelia takes one last stick to the nest. 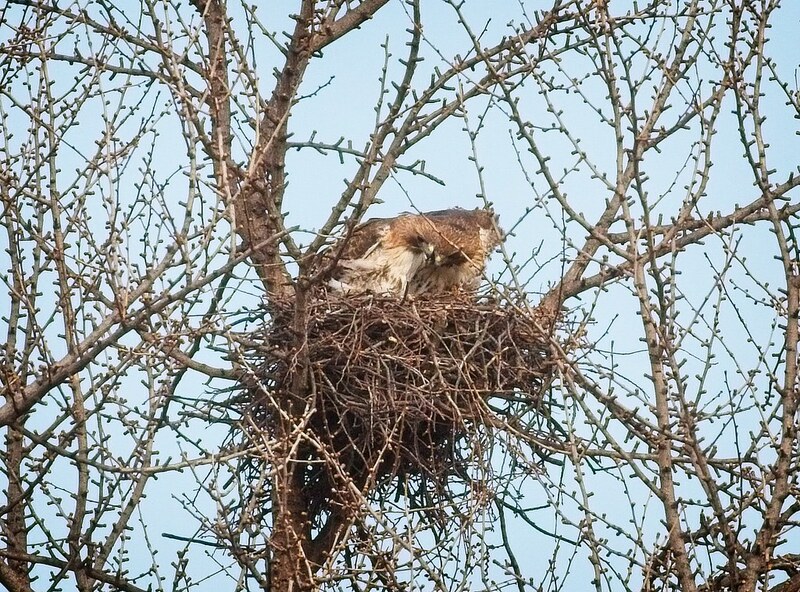 Amelia sits in the nest, which looks more compact and denser than last year's model. 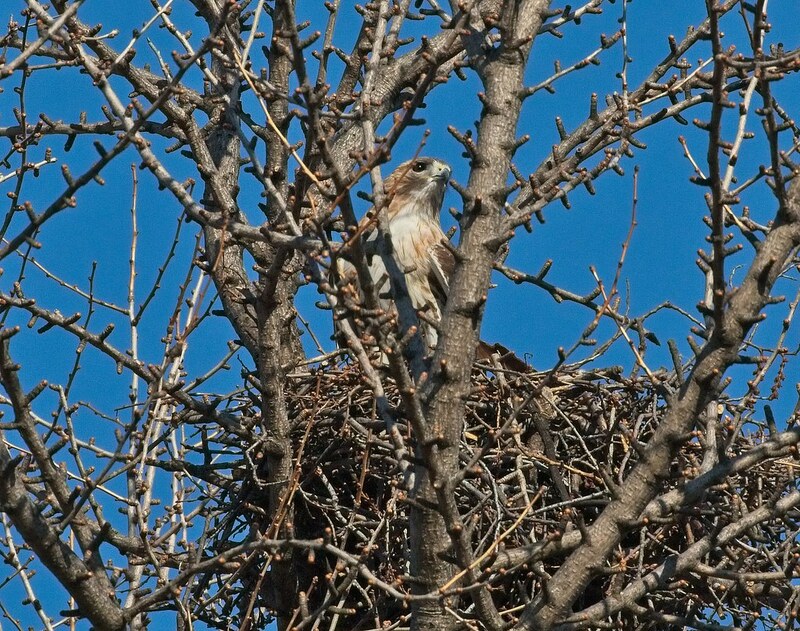 Christo gathers bark to line the nest. 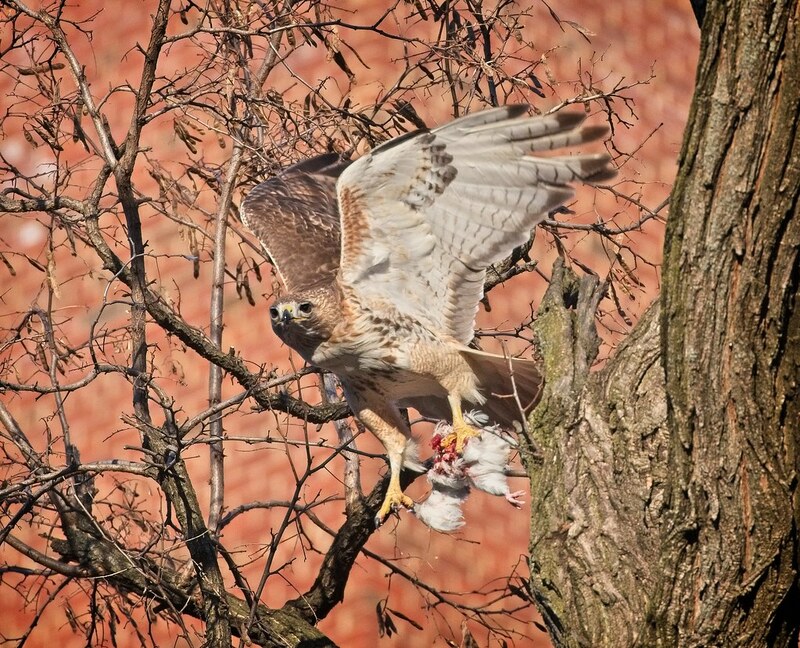 This time, he takes it from an American Elm (he also favors Japanese Scholar trees). 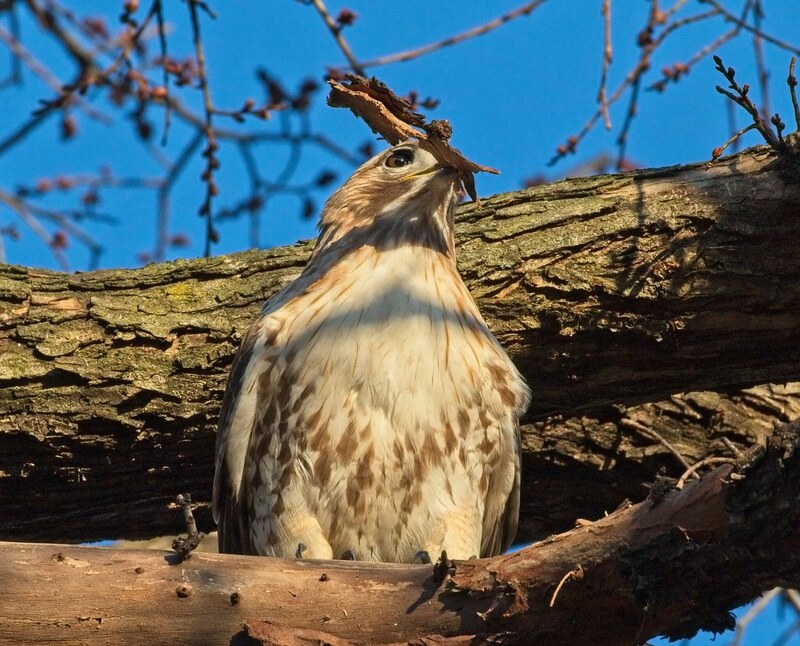 Note the bare branch beneath him - he's picked this one clean. 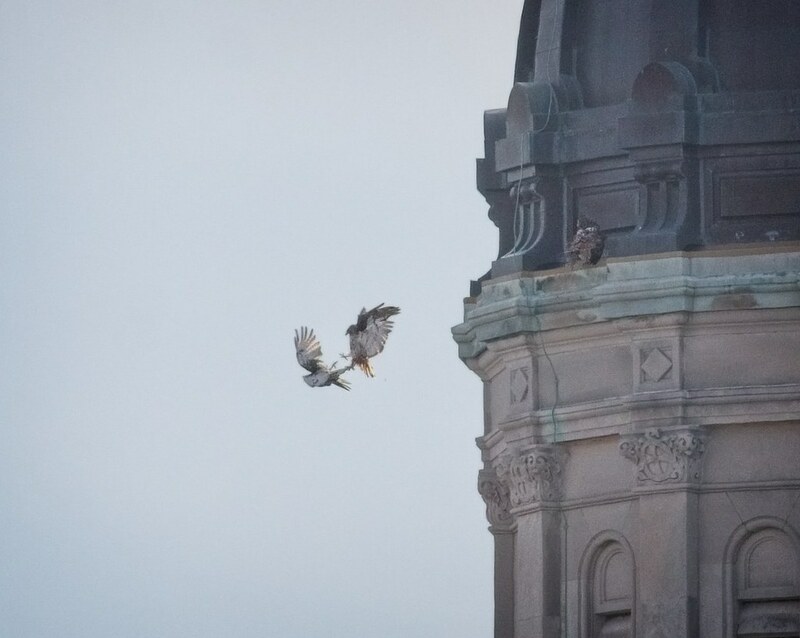 Just before sunset (before egg-laying time), Christo and Amelia perched on the dome of Most Holy Redeemer church on E 3rd Street. Christo is hunching down on the left, so he looks extremely small compared to Amelia. 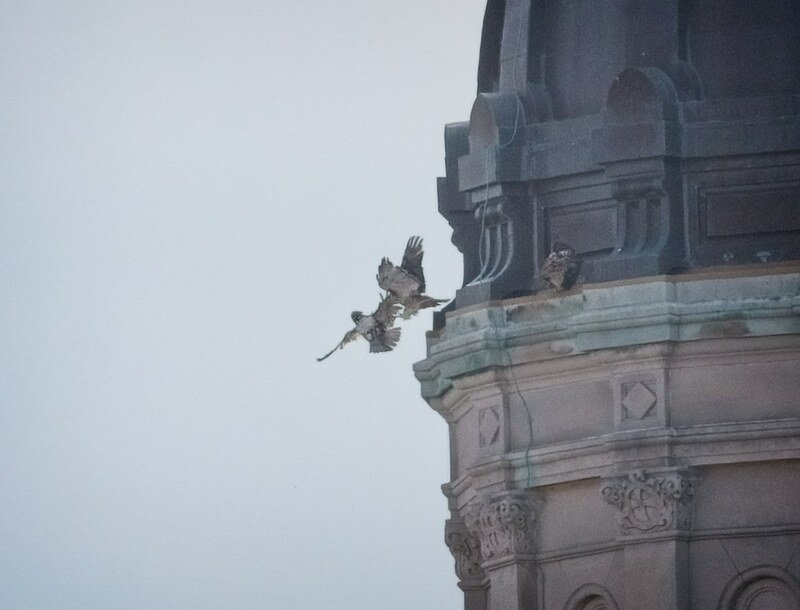 Christo may have been hunching down because an immature red-tail flew right up to the pair and tried to brazenly land on the ledge right next to them. 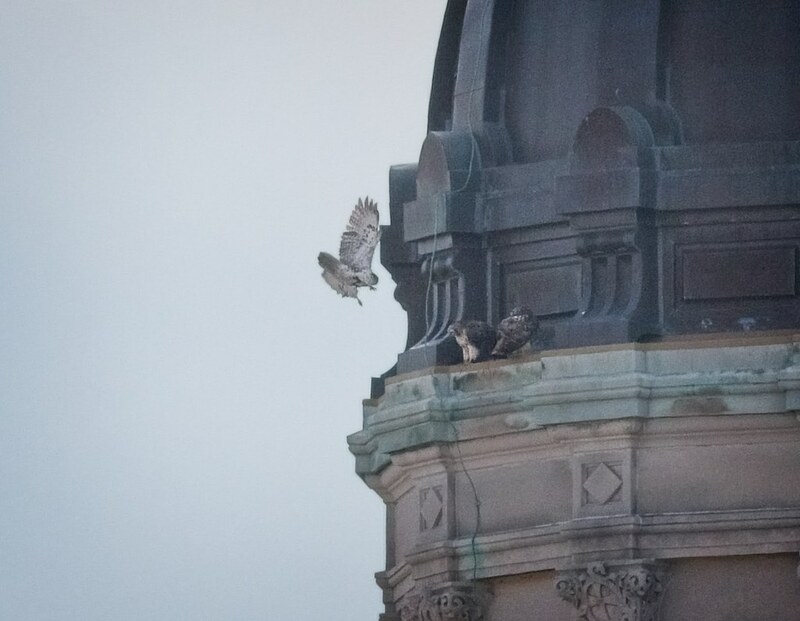 Christo was not having it and dove after the intruder while Amelia remained on the ledge. 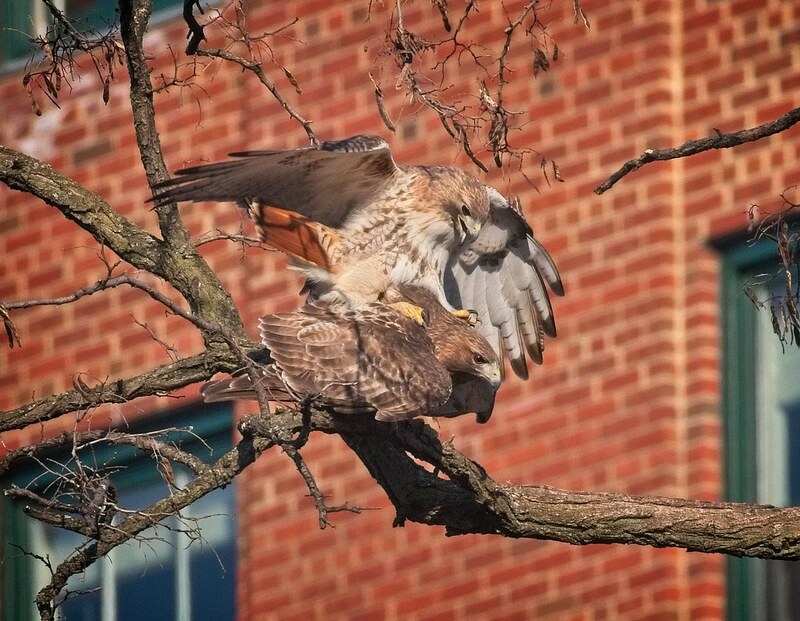 The hawks tumbled in the air several feet before the younger one flew off. 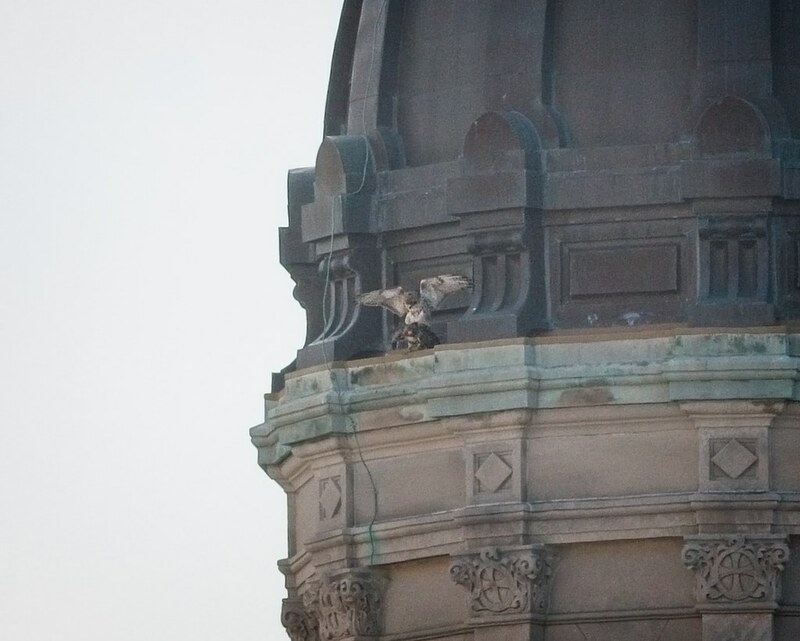 Victorious, Christo returned to the ledge for one more round of mating before nightfall. We can expect hatching around the end of April. 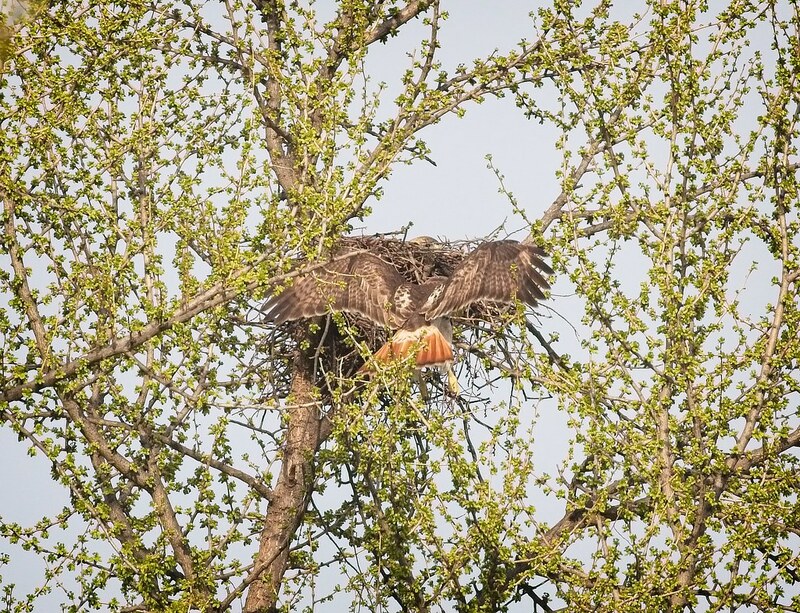 The nest is too high to see newborn chicks, but we should be able to tell that something has happened when the parents start bringing food to the nest.